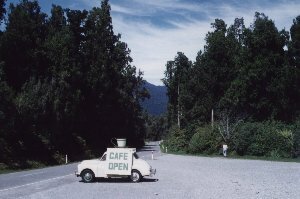 New Zealand Photos by Roger Bourke White Jr.
My longest stay in New Zealand was for three months in 1996. I spent those three months in the city at the end of the world: Invercargil, the southernmost city on the South Island of New Zealand. On the way there I passed this monument. I was now halfway to the South Pole, and that's about as close as anyone gets who isn't treading water or stomping over deep ice sheets. 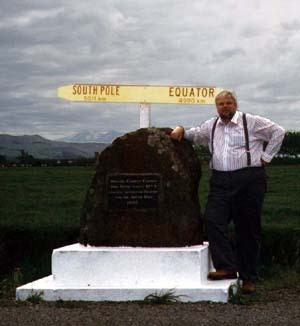 A year earlier I passed a similar monument just south of Yellowstone National Park proclaiming I was halfway to the North Pole. Invercargil was the center of some of the most pristine landscapes I've encountered. North, east and west were scenic vistas. I spent my weekends experiencing them all. 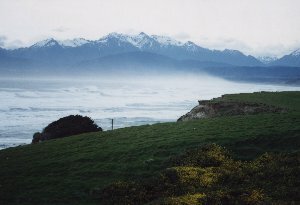 East of Invercargil are the Catlin Mountains and Curio Bay. 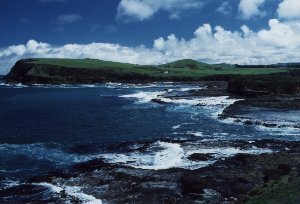 Curio Bay contains one of the few clues to New Zealand's geologic history. Scientists are still not sure exactly where New Zealand fit into the ancient super continent Gonwanaland. The northern parts of New Zealand are new igneous rock, so they offer no clue. But here in the south are sedimentary rocks, and at Curio Bay there is a petrified forest coming to light. The logs appear to be an ancestor of linden trees, and their modern day successors are found in South America. It's likely that New Zealand pulled loose from Gonwanaland along with South America. Near Curio Bay I had my most exciting encounter with New Zealand wildlife. New Zealand was a long way from anywhere when dinosaurs were young, so New Zealand wildlife is something of an oxymoron. (except for the college students on New Year's holiday, but that's another story.) What animal life is here flew over the sea or swam out of it, and here's an example of the latter. 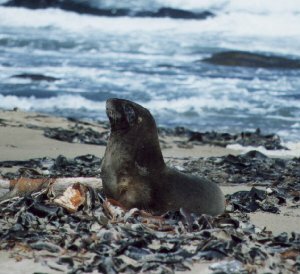 This cow sea lion was one of four that came out to frolic on the beach. They would lumber around for half a minute or so, get tired and flop down to rest. They loved to flip sand on themselves. The cows were fairly oblivious to people watching them, but the bull with them was on the alert. If you got close, he'd chase you away with a snarly growl and big sharp teeth. The four of them put on quite a show. 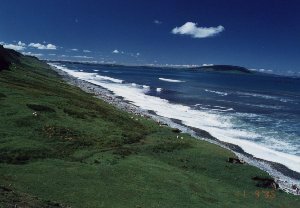 West of Invercargil was the way to Fijordland: the mountainous, glaciated, southwestern coast of the South Island. Roads approach Fijordland, but don't penetrate it. You have to walk or take a boat to see it throughly. I didn't have a boat and I couldn't walk that far. Fortunately, there's a lot to see on the way. This is a windy area. 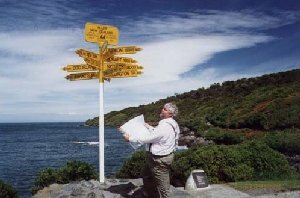 The Fouveux Straight between South Island and Stewart Island is famous for rough water, and the trees on the coast are all monuments to it's relentless pressure. North of Invercargil is Queenstown, the recreational hub of recreation-minded New Zealand. Mondern day bungie jumping was invented in Queenstown, and that's just one of the testosterone-dependant activities going on here. Queenstown and Te Annu are the gateways to Westland, the northern west coast of the South Island. Unlike Fijorland, Westland is inhabited, barely, it's the home for the "rugged individuals" of New Zealand. It's wet and scenic. It's home to New Zealand's easiest-to-see glaciers, and they are fun to see. 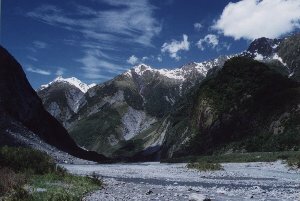 This is the valley of the Franz Joseph Glacier or the Fox Glacier, I've forgotten which. 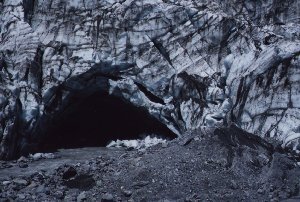 The Glacier face itself had a giant cave in it and a river running out. That cave is large enough to drive a bus into. As I was walking up to get this shot I was thinking how neat it would be to actually walk into that cave, but the closest approach was 500 meters away <sigh>. I sighed until I saw that hanging chunk of ice you see at the mouth come down. It would have flatten me... or a bus! This glacier is active! After seeing the glacier I had lunch at this cafe. Well, this isn't the cafe, but it's a fun way to tell the world it's open for business.